Anyone have the Marblecam app? It's very neat! I really dig it! Check it!! Just downloaded it. Kinda cool. Ha! That's an awesome 1st shot!! 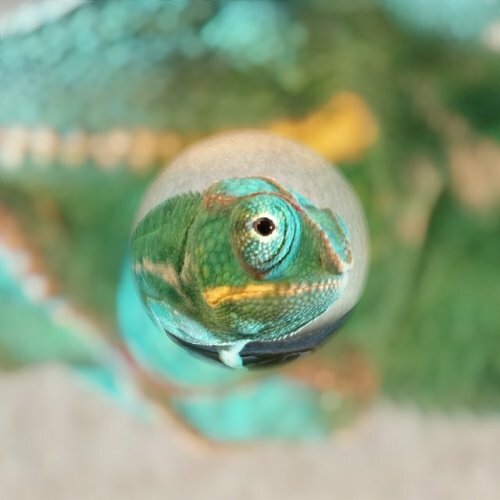 The "marble" is in the chameleon's eye! Woah! That's neat. This is a very neat app! Once you play with it and figure it out, it's really cool! Now lets see a chams eye pic with it! I just downloaded the app. Cool! Nice shot! Fun, isn't it? I want to see feeders next!!! Best I could come up with at the moment. Fun and free. Can't beat that! Yes, quite a lot of fun! Thanks. Unfortunately, I love challenges. . .
Dude, are you just going to shout out from the peanut gallery or are you going to contribute! Let's see whatcha got! Sorry! Im a "program" kinda guy. So yes, Im just chillin at the "peanut gallery"(??? ), and enjoying your pics. HA! No worries. We'll take up a collection to get you a smart phone! My phone is smart!!! Its just a few, well maybe 4-5 years old. Top-o-the-line though! It does its job and then some.